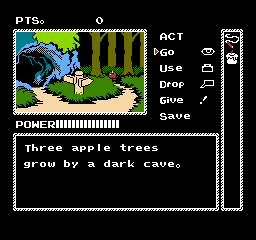 Kaguya Hime Densetsu is an adventure game for the Nintendo Entertainment System. The Moon Princess Legend! 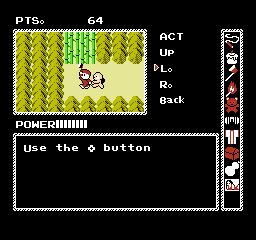 The original game is Kaguya Hime Densetsu c. 1988 Victor Musical Interactive, licensed for Famicom / Nintendo. This title translates as “Moon Princess Legend” based on the Bamboo Cutter’s Tale. You are a young woodsman armed with only a whip, a candle, and the words of a mysterious angel. A Moon Princess has landed upon Earth, and hides inside a glowing bamboo stalk within an enchanted forest. You must seek the hand of the Moon Princess who can only be saved by magical orb that is guarded by a fierce dragon. Saunter through silly side-quests and goofy misadventures! This is a text and graphics adventure with minor side-scrolling arcade sequences. Several surprise endings and three difficulty levels!